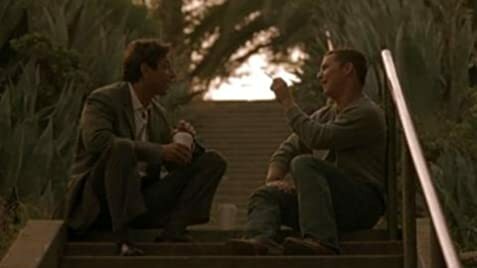 Rusty (Hatosy) starts to pursue a path to a more meaningful life, thanks to his connection to Bob (Goldblum), the boyfriend of his mother, Mary (Lynch). His new take on life causes friction with his best friend, Dallas (Caan), and both men find their friendship pushed to its breaking point, causing them to make life-changing decisions. Transitioning from youth to adulthood, and finding ones self isn't always easy. The genius to keeping my attention in Dallas was gently nudging me through my past by watching someone else through tough times. The movie plays well on the decisions to be made in regards to cultural clashes; city vs.country, divorce and re-marriage, throw in the temptation of drugs,lawlessness honesty and making good impressions. My interest in Dallas stayed at a high level throughout, thanks to the timing with cinematic flashes and real life situations being addressed honestly . The bathrobe that Christian (Val Lauren wears is the same Tyler Durden (Brad Pitt) wore in Fight Club (1999).